Yes, I heard you. What's a GRC (Governance, Risk, and Compliance) book give-away doing on an analytics blog? Well, the short of it is that PackT Publishing are giving away two e-book copies of their book, Governance, Risk, and Compliance Handbook for Oracle Applications, written by Nigel King and Adil Khan. So, if you are interested in getting your hands on an e-book version of this book, please take a look at this tweet, https://twitter.com/oracle_biee/status/250276120031813632, and reply to the tweet with a comment on why you would like this book. The contest will remain open for 10 days, and at the end of the 10 days, two people will be selected to receive the book. 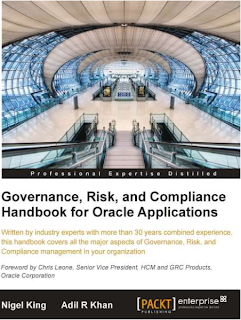 GRC Handbook for Oracle Applications - packtpub.com/governance-ris…Reply to this tweet with a comment why you would like to win this book. And here's hoping that there are more give-aways from PackT Publishing, but with analytics books.